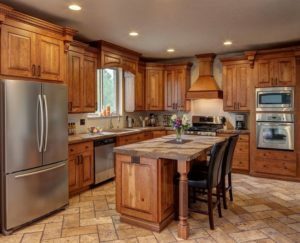 Considering a kitchen renovation can be overwhelming. It’s one thing to buy a house or condo with a kitchen you like. It’s quite another to start from scratch and build exactly the kitchen that will suit your needs. Will it only be used for cooking, or will it be a gathering place? Then, there’s the question of style. Once you’ve decided on the placement of the stove, on the inclusion of the island… how do you want it all to look? Read here to discover one simple kitchen innovation that will transform your kitchen style. Farmhouse style kitchens are one of the most popular styles today. Combining rustic charm with clean modernity, they are functional, stylish, and timeless. One of the greatest appeals for a farmhouse style kitchen is its flexibility. They can be very traditional, with oversized sinks and rustic wood beams, or take a more modern approach and incorporate reclaimed wood as an island countertop or white shiplap on the walls. No matter what you decide in terms of style, there’s one imperative for every farmhouse style kitchen: a window over the sink. A farmhouse style kitchen simply must have a window over the sink! Several windows, actually, letting natural light pour in to create a bright and airy feel. It doesn’t matter if a kitchen is physically small. Large windows and natural light will make it feel much larger than it is. If you’re renovating a kitchen, windows are simply nonnegotiable. If you’re renting, there are many ways of dressing up kitchen windows that won’t endanger your security deposit. Curtains and blinds are common forms of window treatments. Blinds are functional, bland-looking but passive, and allow for some flexibility in openess. Too often, however, the tedium of raising and lowering blinds daily means that blinds always get stuck either open or closed. Open is one thing, but it’s a shame to have a window and never use it! Curtains are another quite popular form of window treatment. Inexpensive and easily changeable, they can be swapped to fit the season or your mood without much difficulty. However, curtains also have downsides. They are impractical in messy kitchens. Nobody wants to be doing extra laundry, and if they’re high enough up to avoid splatters of tomato sauce then they’re too high up to be convenient to reach. A third, unexplored option: shutters. While shutters are often seen on the outside of houses, they are an extremely versatile choice for inside as well. Being stylish, easy-to-clean, and hardwearing, shutters integrate smoothly into a farmhouse style kitchen. They can provide a welcome splash of color or a clean wash of white, whichever best fits your vision. Shutters can provide extra security as well, as some allow you to open windows but lock shutters, preventing unwanted visitor. When designing a kitchen, there are dozens of choices to make. Ultimately, the right answer comes down to what will work best for you. Kitchen shutters are an undervalued and extremely useful kitchen design element.